When I began interviewing business leaders for my new podcast The Inbox Inspiration, I didn’t realize the impact it would have on me. Getting the opportunity to talk to dozens of successful, inspiring individuals has been nothing short of incredible. Through our conversations, I got VIP access to some of their secrets and advice, what motivated them, what helped them to get where they are today. 1. 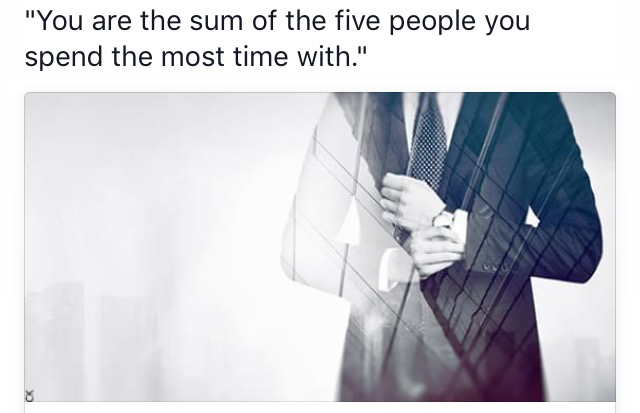 You are the sum of the five people you spend the most time with. My mom always used say, “Tell me who your friends are and I’ll tell you who you are.” And she was right on—because millionaires surround themselves with other millionaires. If we really are the sum of the people we surround ourselves with, it’s so important to surround yourself with the right ones. Successful people are always networking with each other at events, conferences and mastermind groups. 2. Money in itself won’t make you happy. But money can buy you the freedom to do the things that can make you happy. True happiness comes from filling your time and your days with meaningful pursuits that you’re passionate about. I’ve met rich people who are incredibly unhappy and poor people in Third World countries who are some of the happiest people I’ve ever encountered. The point is that it’s possible to be happy right now, whether you have $20 or $20 million. By being grateful for what you have, for being alive and for having this day, you’ll be more present and have better perspective. 3. “It’s not about the goal. It’s about becoming the type of person that can accomplish the goal,” the great Tony Robbins said. He probably knows what he’s talking about. Most millionaires will tell you it’s not so much about making the money; it’s about growing as a person, growing your business to a point where it’s capable of making money. The journey is far more valuable than the destination. 4. Get a mentor so you can get growing. Almost every successful person you ask will tell you they had a mentor at some point along the way. Find someone you admire, look up to—someone who’s where you want to be—and ask them for guidance to help you improve who you are and what you want to become. With their advice, you’ll learn best practices, you’ll be challenged, you’ll be better prepared to succeed. 5. Like to learn. Every entrepreneur and successful person I’ve met is a lifelong learner. They understand the importance of constantly improving, constantly growing. Driven people self-educate through books, audiotapes, online courses, seminars…. They’re determined to always learn new skills, to keep developing as a person—to never become stagnant. They never stop. 6. Two (or three or four) income sources are better than one. Millionaires know how to put their money and resources to work for them. And almost all of them have at least two more sources of income—investments in financial securities, real estate, angel investing, partnerships. 7. Hate the gym? Well, learn to hate it a little less. Almost every millionaire I’ve interviewed has some sort of rigorous workout routine—weightlifting, marathons and triathlons, running. They’re elite in business and at the gym. There’s a correlation between breaking down barriers in fitness and breaking them down in business and in your mind. They’re both about strength and confidence, discipline and commitment. Weak won’t cut it. So get workin’ on your fitness—and the rest will seem a little less daunting. 8. Read—a lot. I’ve yet to meet a millionaire who doesn’t do a lot of reading. And I’m not talking about Harry Potter or Hunger Games. I’m talking books with real, practical tips—for personal and professional growth, for people who want to constantly improve themselves and their businesses. Books are a great way to learn from successful people who may have been where you are now and have something valuable to teach you. It’s like having some of the best business minds of our generation mentor you. Read a lot and read often. 9. Write down your experiences. You don’t have to blog to be a millionaire. But it wouldn’t hurt. A lot of successful people are getting their start from blogging. It’s a powerful tool, because by documenting your journey and inspirations, you go through a sort of self-discovery, while also growing your reputation and business. If you’re not ready to share everything on a public blog, try keeping handwritten journals instead. The introspective writing process reminds you of what you’ve been through and where you want to go. And writing down your goals is an incredible way to make sure they happen. Jim Rohn said it best: “It is challenging to be a student of your own life, your own future, your own destiny. Don’t trust your memory. When you listen to something valuable, write it down. When you come across something important, write it down. Take the time to keep notes and to keep a journal” (or in my case, a podcast or blog! ).